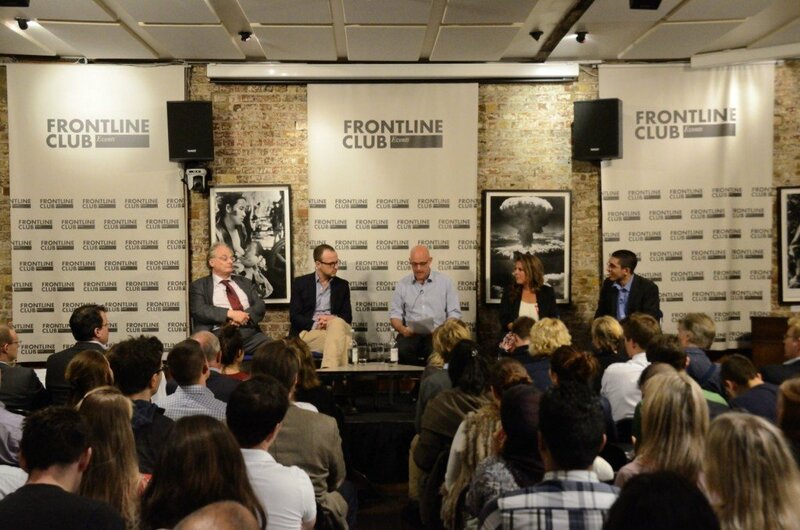 The threat posed by the Islamic State of Iraq and al-Sham (ISIS) and the international network of militants it has spawned will be with us for a “generation”, according to experts speaking at the Frontline Club on Wednesday 24 September 2014. On the day that the UN security council agreed to launch an effort to prevent the flow of foreign jihadis in support of the Islamic State and US-led airstrikes continued in Syria, the Frontline Club panel underlined the seriousness of the ISIS threat and sought to explain its appeal to an estimated 15,000 foreign fighters. Hosted by Sky News foreign affairs editor Sam Kiley, the debate brought together Peter Neumann, Professor of Security Studies at the Department of War Studies, King’s College London, and founder and director of the International Centre for the Study of Radicalisation (ICSR); Alia Brahimi, visiting research fellow at the Oxford University Changing Character of War Programme at Pembroke College, Oxford and author of Jihad and Just War in the War on Terror; Aymenn Jawad al-Tamimi, a recent graduate from Brasenose College, Oxford University, and a Shillman-Ginsburg fellow at the Middle East Forum; and Patrick Cockburn, a Middle East correspondent since 1979 and author of The Jihadis Return: Isis and the New Sunni Uprising. The panel was unanimous in its belief that the airstrikes launched by a US-led alliance on Monday 22 September would not bring a speedy halt to the ISIS insurgency, something that UK prime minister David Cameron and a spokesperson for the US defence administration later admitted. “The US is trying to cut them off at the head, but we have to cut them off at the legs and deal with the causes,” said Brahimi. ISIS has taken advantage of a groundswell of anger and disillusionment among unrepresented Sunnis, which make up about 20% of the population in Iraq and 60% in Syria, and tapped into a history of insurgency that dates back to the US-led invasion of Iraq in 2003. The conflict has attracted between 12,000–15,000 foreign fighters to Syria and Iraq in the past three years, the largest overseas participation of independent fighters since Afghanistan in the 1980s, according to Neumann. Foreign combatants make up an estimated 40% of ISIS recruits.